Newby Moss is an area of bleak moorland where a thick layer of glacial drift has completely obscured the Great Scar Limestone beneath. 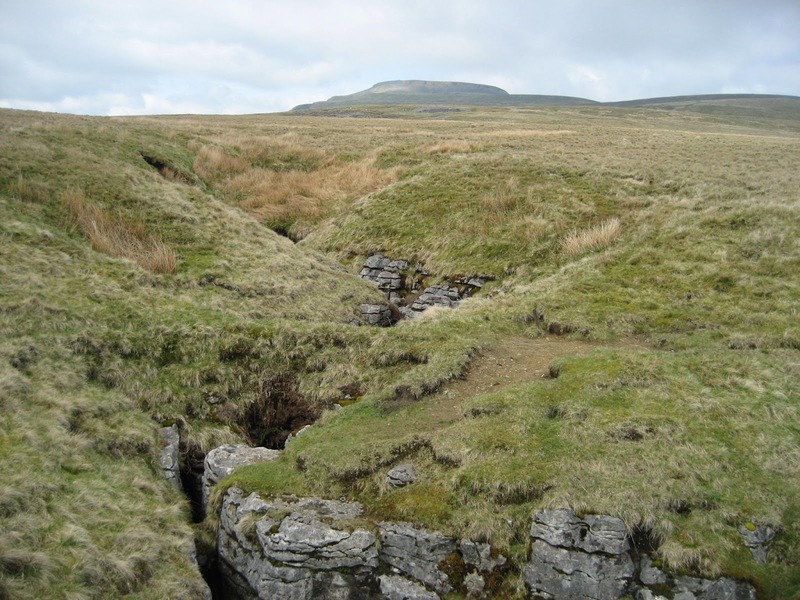 It is bounded along its south-western edge by the Craven Faults, and the limestone bench beneath the drift cover is actually the highest on Ingleborough, at 455 metres above sea level. 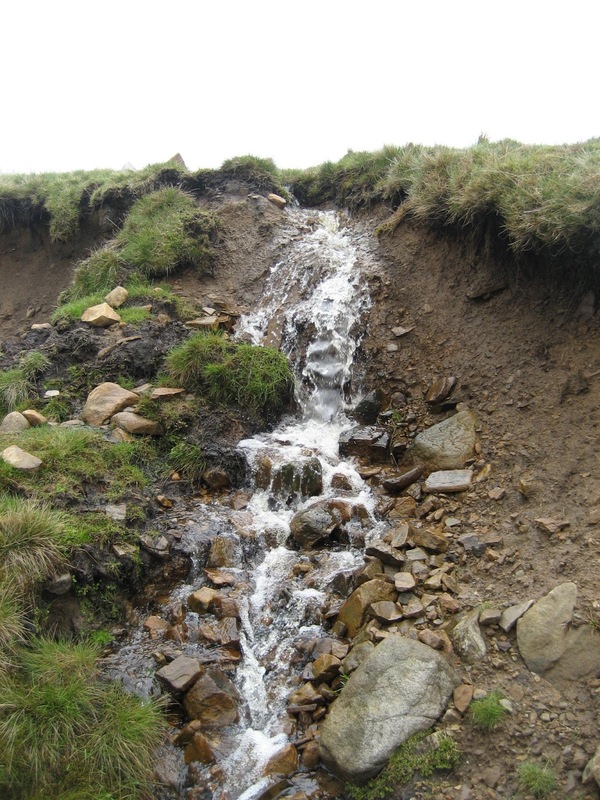 The drift was deposited due to the area lying immediately in the lee of the Ingleborough summit mass, where ice flow in the Pleistocene was considerably slower – encouraging the build-up of material. For the limestone enthusiast, this means that many caves that may well lie below have been completely covered, although one or two spectacular shafts do allow us tantalising – and at times horrific – glimpses into the deep interior. The Moss is conveniently split into two by the major stream of Grey Wife Sike, which used to sink much further down the fell and these days vanishes into an obscure pothole named P2a (SD737723). 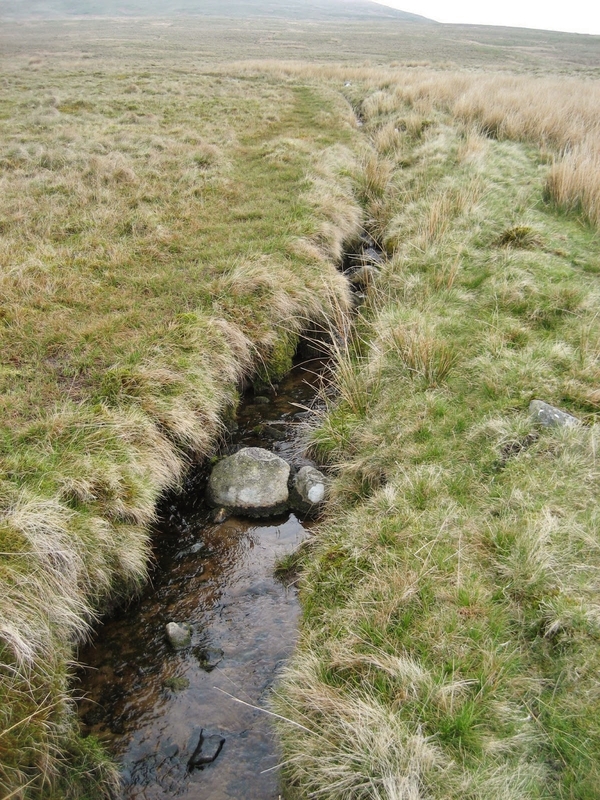 The dry valley of the former stream channel can easily be traced above Newby Cote. 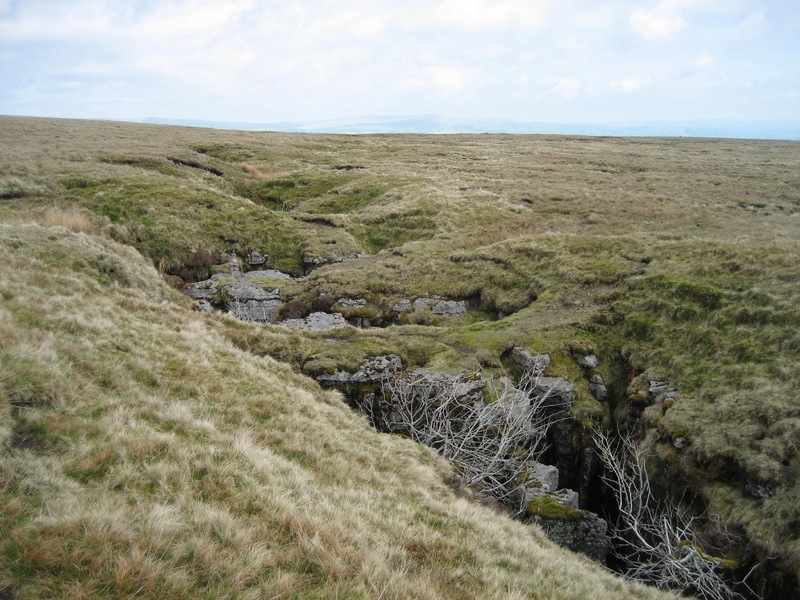 West of the sike, the boundary of the Yoredale Series extends further over the buried limestone, whereas towards the Clapham side, on the east – there is a wider bench of limestone beneath the drift cover, giving a chance for more significant horizontal caves to develop. 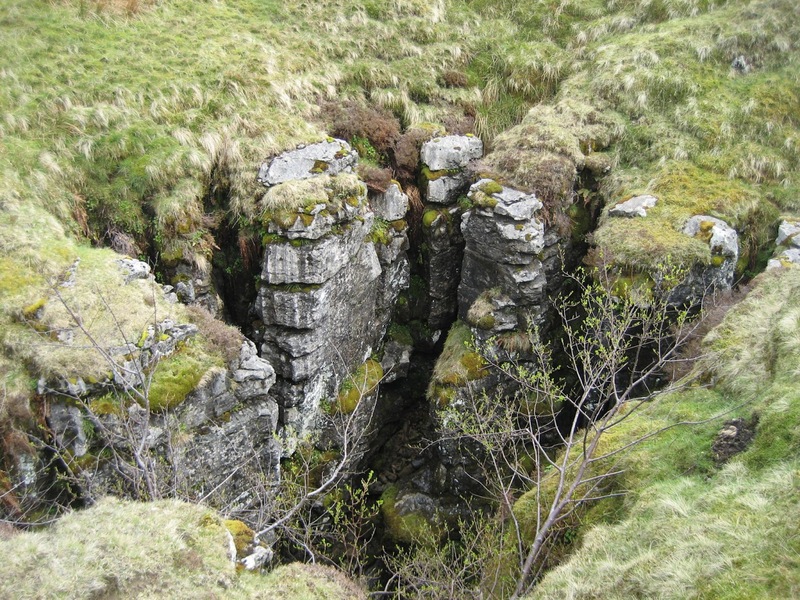 The well-known characteristic of the Newby Moss shafts is that, unlike many of the potholes surrounding Ingleborough, they are merely vertical – with very little horizontal cave development at depth. Most of the deep holes land on nothing more than cobble-choked floors, spectacular as they are. The reason for this is not fully understood, but they are believed to have been formed by meltwater sinking through crevasses in the ice – these creative streams having long since vanished, with streams of only mediocre size now taking their place. East of Grey Wife Sike, Newby Moss Pot itself lies in the bottom of a doline with a notable bridge at the bottom. Formed on the Clapdale Fault, it contains a series of shafts and about 200 metres of stream passage before ending in a boulder-choked rift. Flowstone in the entrance has been dated back 350,000 years making the origins of the system pre-Anglian. 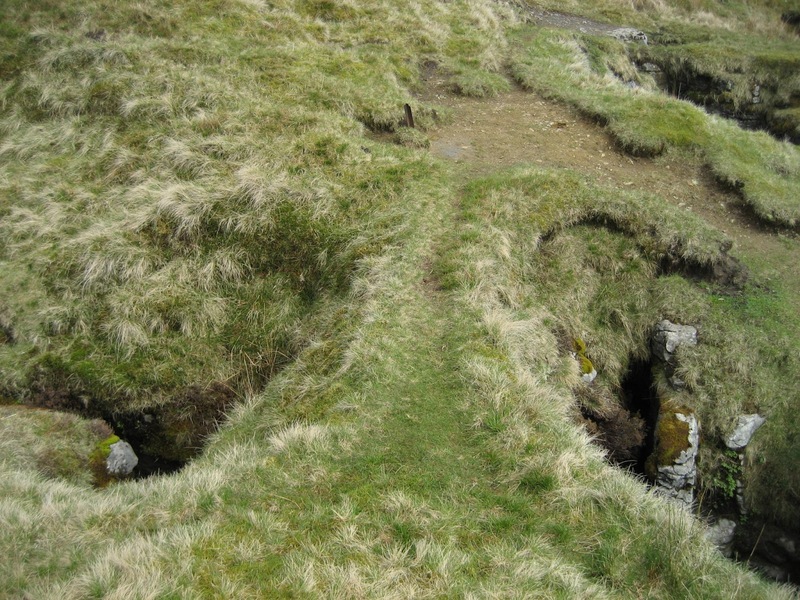 The pot used to swallow the water that now sinks in the nearby doline of P2; water that was once proved to emerge at Clapham Beck Head, and was therefore linked to the Gaping Gill system. This would therefore indicate potential for further cave passages undiscovered below the moss, and perhaps one day a Newby Moss Master Cave may even be discovered. The presence of Grey Wife Hole nearby (SD741722) with its 400 metres of horizontal passage and rifts to the wonderfully-named Paradox Pond, adds further fuel to this potential. A number of well-known shafts with very little horizontal development lie to the west of Grey Wife Sike. The dip of the Great Scar Limestone, back towards the summit mass of Ingleborough, may well be another reason for this. 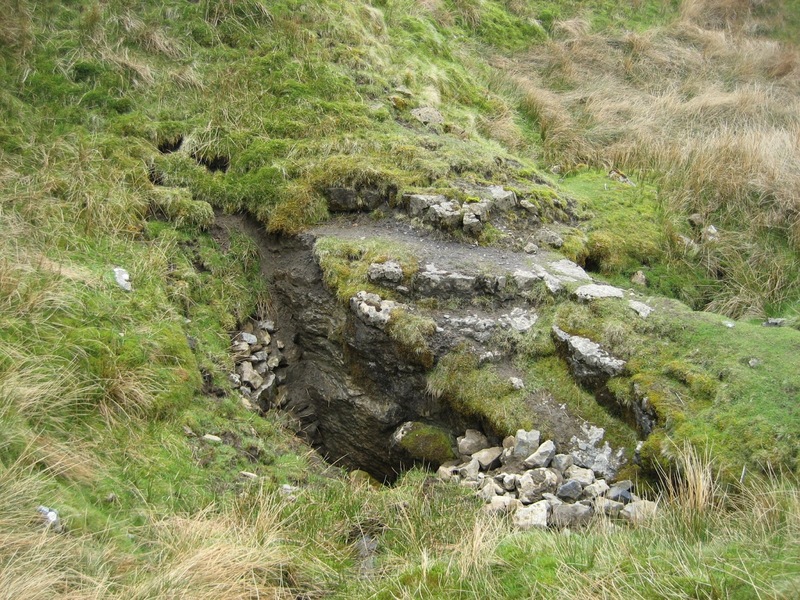 Fluted Hole (SD734724), at 457 metres above sea level, is the highest stream sink in Great Scar Limestone on Ingleborough, swallowing a small stream which sinks into cobbles in the floor and emerges in Clapdale at Moses Well – an impressive 251 metres lower down! Its route remains unknown, but what cannot be denied is the sheer beauty of the entrance shaft. Fluted columns of limestone emerge from the depths, surrounded by a wealth of lime-loving plants – and the alternative name of ‘Fairy’s Throne’ is a good one. Equally attractive are the wonderful Pillar Holes (SD733724) lying close by. 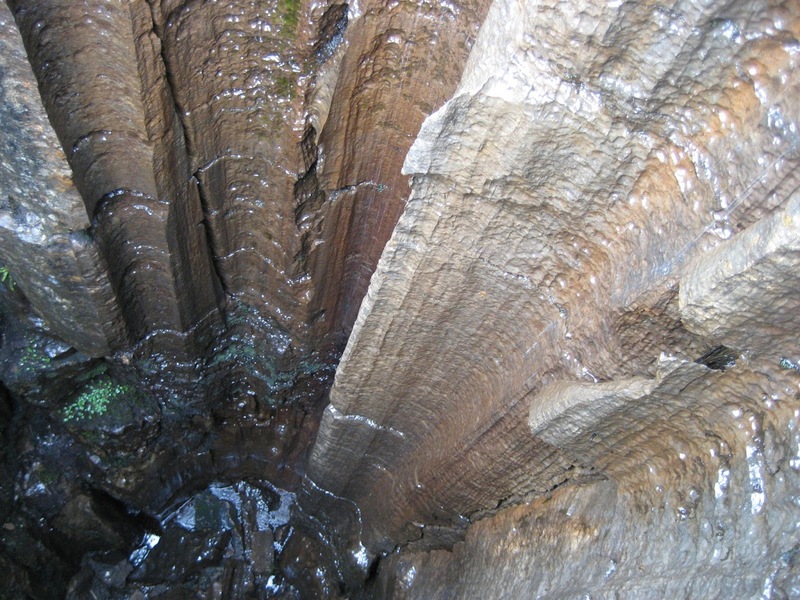 Here a series of beautifully fluted shafts – some dyed pink by impurities in the limestone, descend a total of 87 metres to be interconnected by passages through shale beds, but there is no horizontal development. Everything of interest lies immediately below the entrance series. Formed again along a fault, they are worth a trip for the beautifully sculpted limestone architecture. Beyond these two beauties lies the horror. ‘Beauty and the Beast’ works well on Newby Moss. Two insignificant holes at the southern end of an ‘L’-shaped rift (SD731724) are crossed by a grassy bridge. The hole on the north side, barely eight feet wide, drops a spine-chilling 292 feet and was clearly a former stream sink as the current cascade falls in the same rift just a few metres away to the north. This is Long Kin West – and, as Wainwright warns us (1991) ‘If life is considered precious – keep well away.’ The two immense shafts, either side of the bridge, are linked by a passage through a shale bed 100 metres down, but the deeper of the two continues to drop to a total depth of 168 metres (500 feet)-far and away the deepest daylight shaft on Ingleborough. 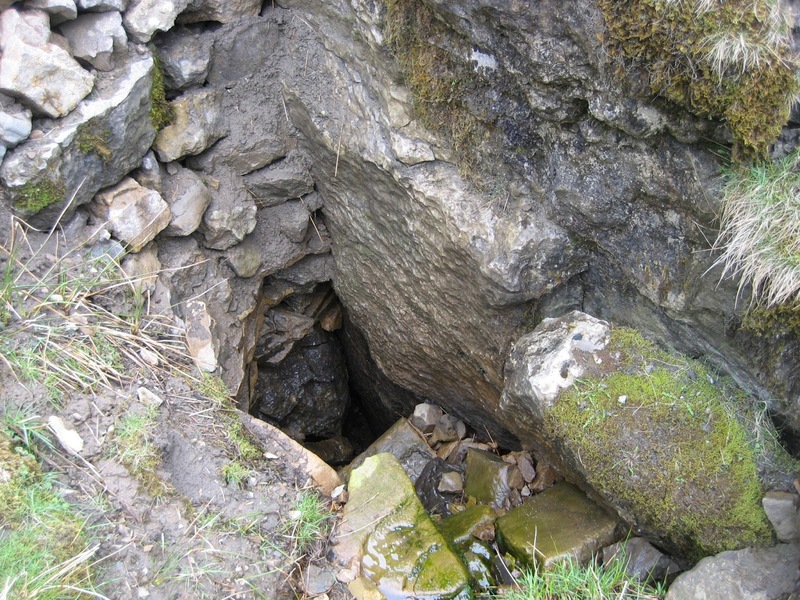 As the pot has little if any horizontal development – no dangling ropes means no cavers below. Drop down a small pebble and it is horrifying to see how long it is before you hear that final ‘ping.’ The water from Long Kin West disappears inside and is not seen again until it reaches Moses Well in Clapdale, just above the ‘lake’. 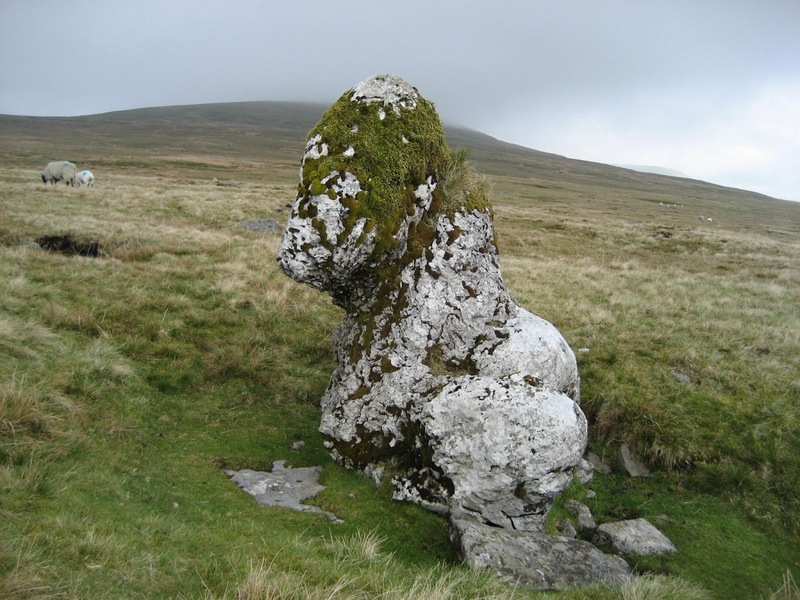 Clearly, the mysterious underworld of Newby Moss is one of Ingleborough’s great enigmas.